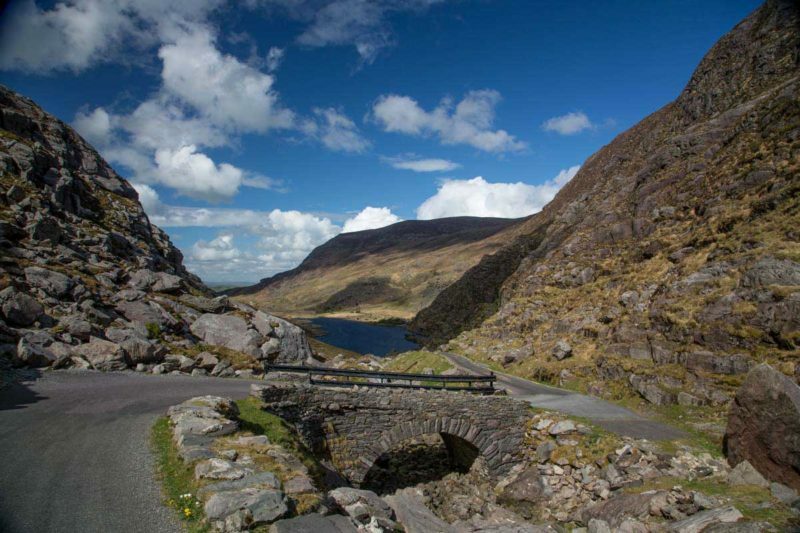 We decided to cycle the through Gap of Dunloe after hearing it was a special thing to do in Killarney. We rented our bikes from David at the Killarney Bike rental at Flesk Caravan Park just a short walk from our hotel. David charged us €15 per bike we got helmets and a lock for the bike which proved handy when we visited Ross Castle. Our Hotel booked us on the boat with a local legend called “Ducks” according to our Concierge he is the best story teller on the Lakes of Killarney. We cycled into Killarney and found the playground where we would follow the path to the end and join the main road for a few miles before arriving at “Kate Kearney’s Cottage” an old Poitin house, like “Moonshine” if you get my drift ! From here we entered the Gap of Dunloe a Glacial Valley with a meandering path, walls of Mountains and beautiful lakes. There is a good climb by Turnpike Rock which looks like a gateway to the top. Here we found more Lakes and Bridges which brought us to what’s known as the “Head of the Gap” the highest point of the trip. Now we were looking down into Black Valley and descend slowly enjoying the Views and pass a small Village with fields with stone walls. 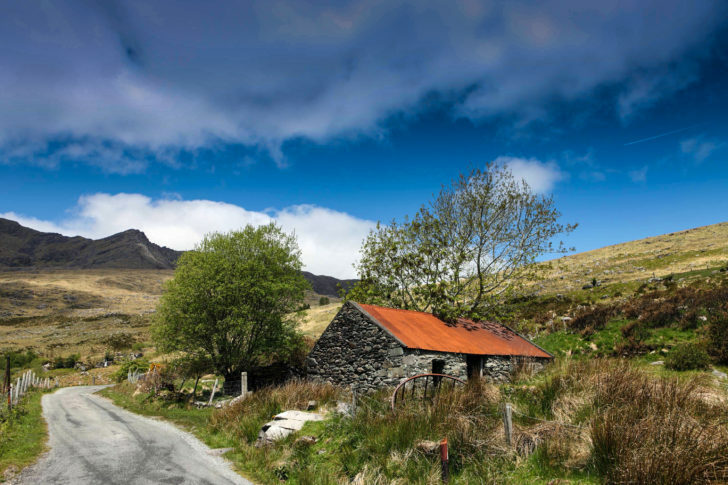 There is a sign for Lord Brandon’s Cottage and down that road you must stop and look back, it has to be the best backdrop on all the sites we have seen in Ireland. A beautiful view with high mountain peaks and beautiful colors before we come across a multiple arched bridge down by the Cottage. We had Coffee and fresh Sandwiches in this beautiful location, this was our first sighting of the legend that is “Ducks” he carried our bikes to the Boat and spoke in a dialect you could only imagine in a supernatural Movie. It was a gentle but profound speech as if it was from many years past, never before had we heard such a voice, it was Irish Bliss for us. We had never heard of the Teezze Weezees, but for those of you who don’t know about them “Ducks” meets them all the time and has great stories to tell about these strange creatures among many other things of great interest. I will not take from your experience by telling you too much but all I can say you will not be disappointed. There were two White Tailed Sea Eagles flying over ironically what’s known as the Eagles Nest, passed the Meeting of the Waters, Dinis Cottage, another two bridges and back into the big Lake. We had a good time on the Lakes of Killarney where there is an Old Abbey and Monastery where the High King of Ireland was educated by Monks over 1,000 years ago. The panoramas on the Lakes are unreal, Devil’s Punchbowl, Torc Mountain, Purple Mountain, Oak Woods and so much more. Arriving at Ross Castle a striking Castle on the landscape rising high above the Lakes. It is here we depart our Boat and say farewell to “Ducks” we heard his father was a Boatman, and his Father and the many fathers before, Shir tis no wonder he has the “Gift of the Gab” and is a True Irish Legend. He told us his real name is Donal O’Donoghue and it’s no surprise Ross Castle was an O’Donoghue stronghold. He passed our bikes to us when everyone else had departed the boat and in an instance he was gone. We still think to this day did we really meet “Ducks” or was he in our imagination, a magical experience none the less. We visited Ross Castle before we returned our Bikes and walked back to our Hotel for a well-earned pint of Guinness and a white Wine overlooking our favorite view discussing the great day we had.